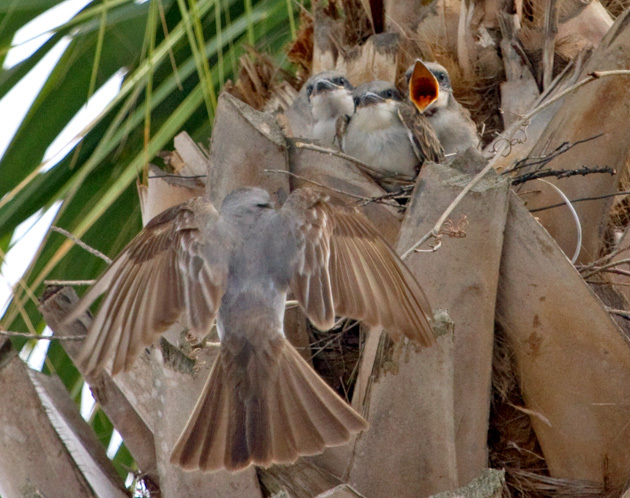 Gray kingbirds are doing well on Tybee Island! One pair nested in early June in a palm and Hotel Tybee and fledged 3 chicks. 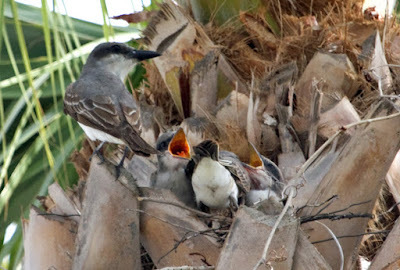 Then Mrs. Kingbird moved to the palm tree next door and started a second nest. 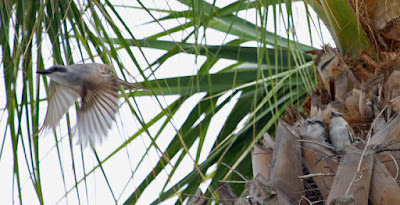 I had observed her flying in with bugs but the young ones were deep in the nest and I couldn't tell how many there were. 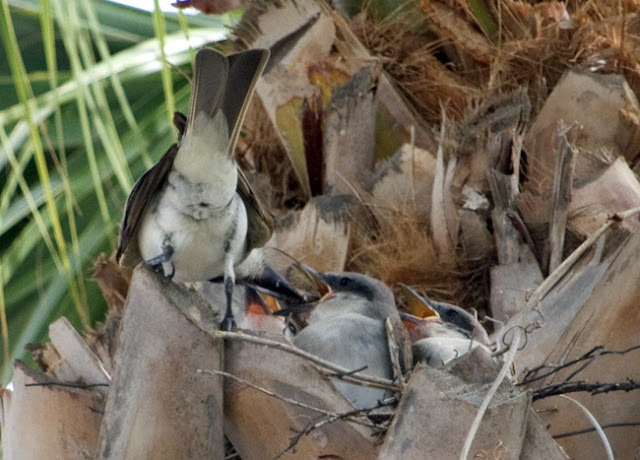 Today, when I looked at the palm, there were three juvie gray kingbirds all in a row, trilling that wonderful "pittirri" call. 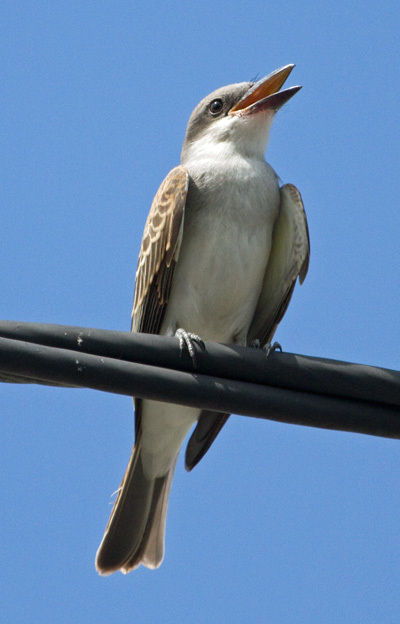 I checked the wires and found an adult (I think Mom) perched nearby. 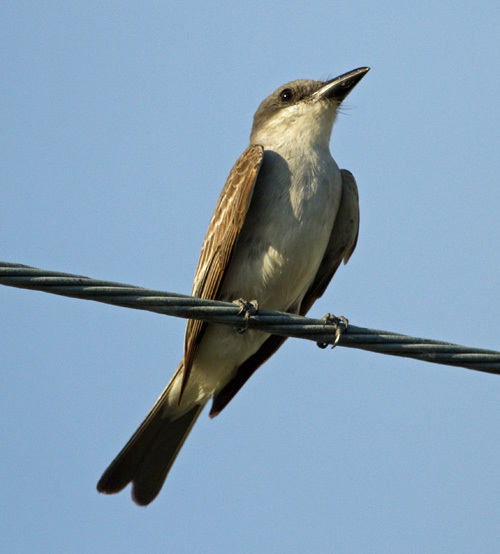 Gray Kingbird adult on wire. She was working hard to bring in the bugs for her growing brood. Off to get more bugs! Bug delivery isn't easy, nor is choosing which mouth to stuff it in! This time the middle one gets lucky. It turns around to poop while the siblings keep begging. At the other end of Butler Avenue, near the Sugar Shack, I found 2 more Gray Kingbirds. 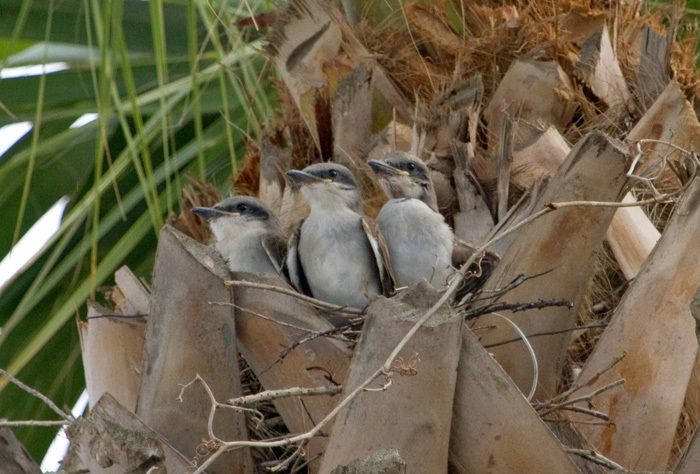 Obviously, this species is doing well on Tybee. 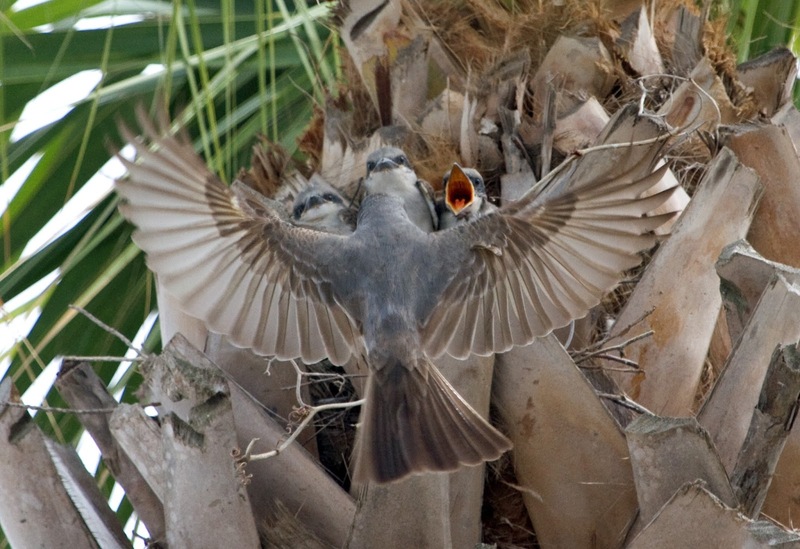 Many of the island mockingbirds have started imitating Gray Kingbirds so if you hear one, be sure to look twice!! Well I am a little late with this report but life has been busy. 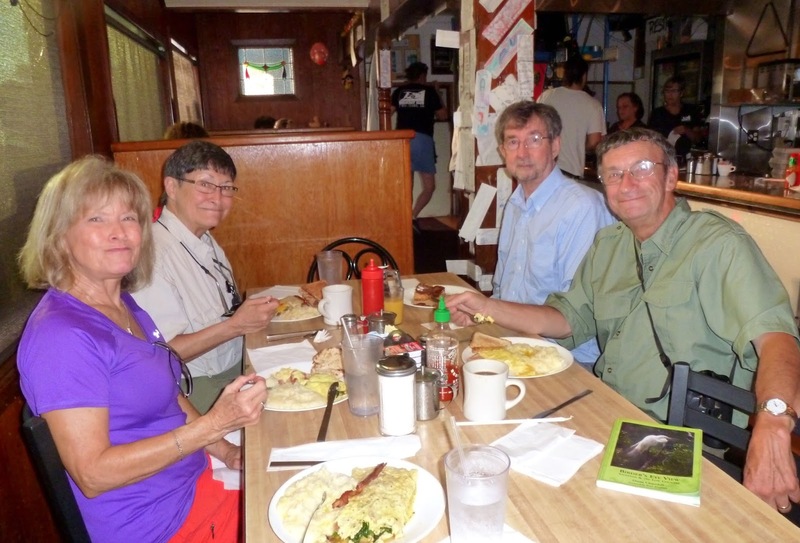 On the 19th of July, my birding mentor Bill Drummond came to visit for a few days. We started the first morning of his visit with a trip to the Breakfast Club. He had read about it in my book and wanted to experience Tybee. We were joined by fellow participants on Bill's 2012 trip to Alaska Matt Ryan, Brenda Brannen & Sandy Beasley. After breakfast, we walked down the street to check on the gray kingbird family next to Hotel Tybee. Even though the palm trees had been trimmed, Mrs. Kingbird was sitting on her second nest. We found a couple of juveniles from the first clutch still begging. Gray Kingbird mom on the nest. Next, we stopped to check for Roseate Spoonbills at the Horsepen Point pond. 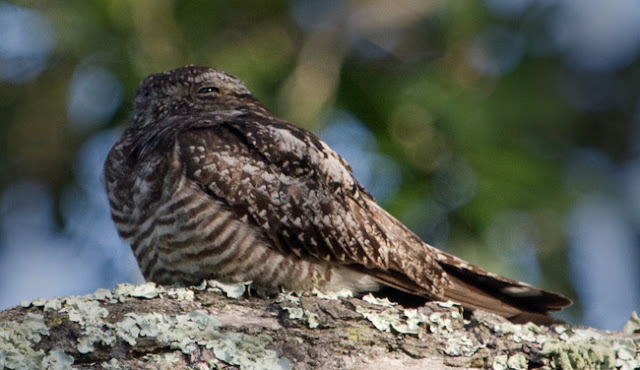 We didn't find one, but sharp-eyed Brenda spotted a common nighthawk roosting on an oak branch. 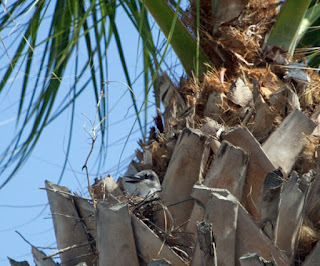 I didn't have my camera, but I drove home and got it, returning to find the nighthawk still snoozing on its limb. Common Nighthawk snoozes on an oak branch. 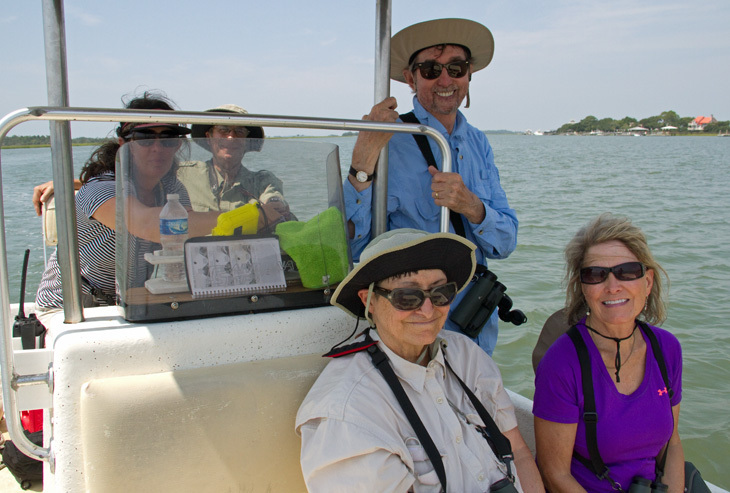 At last, we joined Captain Rene Heidt and Sundial Charters for a boat trip to Little Tybee. Highlights were more than 40 black terns, at least 4 reddish egrets, and a marbled godwit hanging out with a whimbrel. 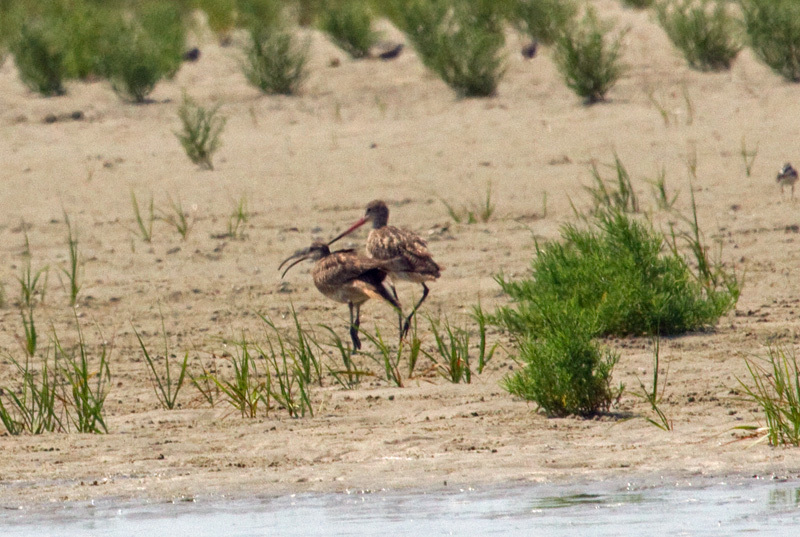 There were also flocks of semipalmated plovers and short-billed dowitchers still in their rusty breeding plumage. Black Tern molting out of breeding plumage. 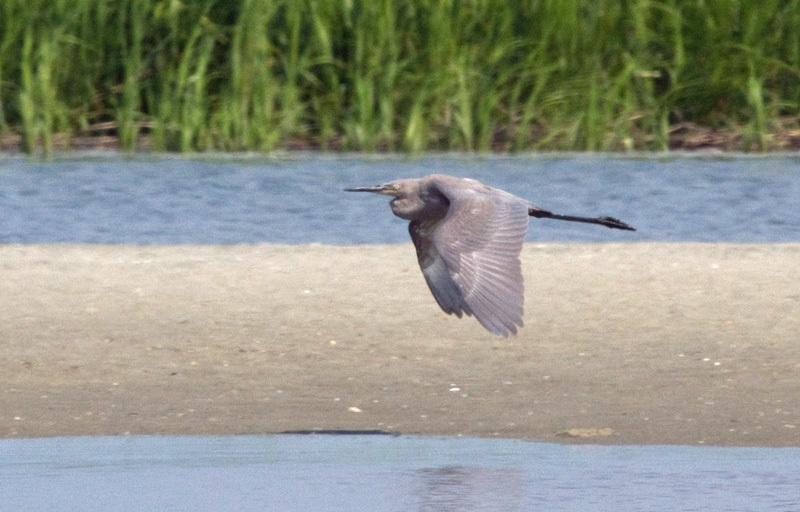 That evening, I took Bill down to the north end of Tybee. It was low tide, and the first thing I spied as I looked at the two pilings that mark the outflow of the water treatment plant was the snout of a manatee. Bill was captivated and we watched for about 45 minutes, eventually seeing two snouts together. We shared the experience with other beach goers in the area. Manatee shows a bit more than a snout. 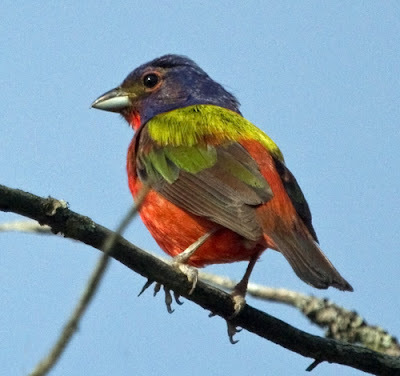 Bill wanted to see a painted bunting and I was gratified that both male and female visited my feeders while he was here. We also made a trip to Skidaway State Park and found several buntings, many still singing. 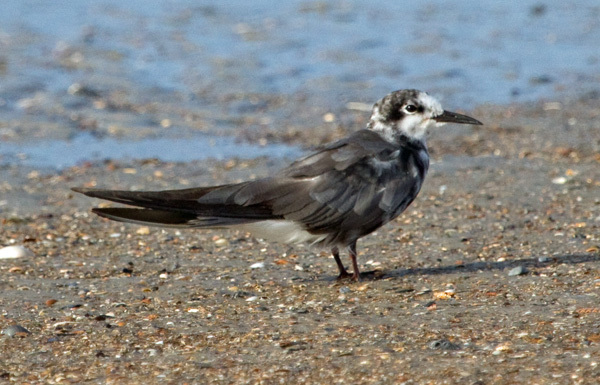 We drove around the county on Monday afternoon, searching in vain for a swallow-tailed kite. We saw Mississippi kites in several locations, and got good looks at a yellow-billed cuckoo at the entrance to the Solomon Tract. 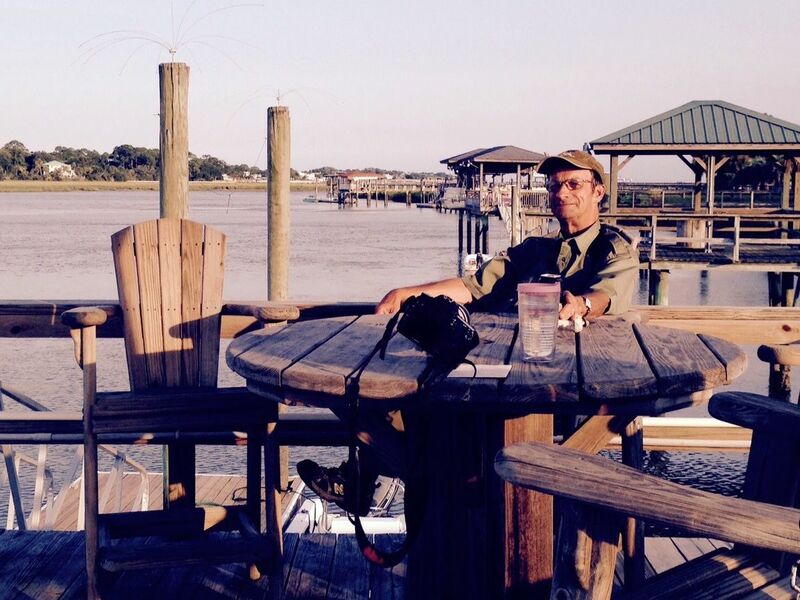 Monday evening, we lounged on the dock, hoping to hear the harsh laughter of a clapper rail. 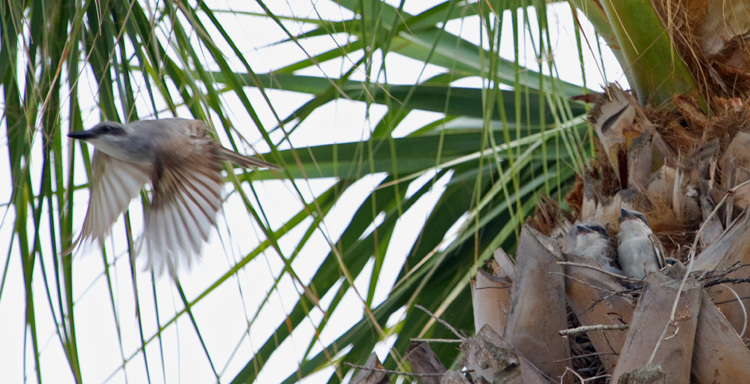 All in all, it was a fun trip with many good birds. Gen. Bill Drummond lounges on the dock at Chimney Creek.